A Barometer is an instrument which is governed entirely by the pressure of the atmosphere, and, in consequence, shows at once when that pressure is changing. If the pressure at one place on the earth's surface be greater than at another, the air has a tendency to move from the place where the pressure is greater towards that where it is less, and thus" wind" is caused. A change of weather comes almost always with a change of wind, and on the extent of this change depends whether the new wind is warmer or colder, damper or drier, than that which has been blowing. In general, if the level of the mercury in the barometer continues steady, settled weather may be expected, but when it is unsteady a change must be looked for. A sudden rise of the barometer is very nearly as bad as a sudden fall, because it shows that the atmospheric equilibrium is unsteady. A Mercurial Barometer in its simplest form is merely a glass tube closed at one end and filled with mercury, which is then boiled in order to extract any minute quantities of air which may be adhering to the sides of the glass, after which it is inverted and its open end placed below the level of the surface of the mercury in a small cistern. The mercury now descends in the tube until the weight of the column is balanced by the pressure of the atmosphere on the mercury in the cistern, thus affording a correct measure of such pressure. By means of a scale of inches, whose zero is level with the surface of the mercury in the cistern, the exact height of the column can be recorded. Certain corrections have to be made to the readings as shown by the barometer, in order to make comparisons with other barometrical observations. 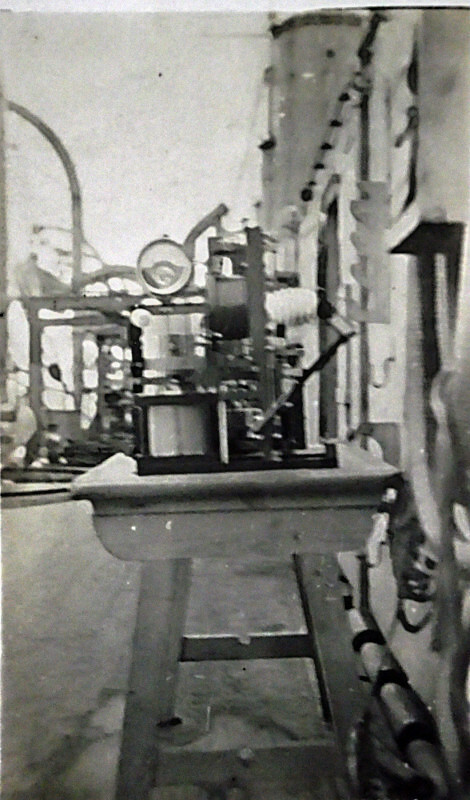 (1) The bore of the marine instrument is contracted for the greater part of its length in order to prevent an up-and-down motion of the mercury (technically called "pumping"), due to the rolling and pitching of the ship; this contraction, however, increases the friction of the mercury in the tube, and consequently makes the marine instrument somewhat slower in recording a change of pressure. (2) The second important difference is that the zero point in all standard barometers from which the graduation commences is a fixed ivory point depending from the top of the cistern in the shore instrument, and provision is made for altering the capacity of the cistern so as to enable the level of the mercury to be exactly set at this point just previous to an observation being made, thus cutting out the connection for "capacity," which is allowed for when reading a marine barometer, but the necessity for applying an actual correction in the marine barometer is avoided by manipulating the scale in such a manner as to give a correct difference between the level of the mercury in the cistern and the height recorded. This is done by the manufacturers. It should be remembered that when reading the barometer the zero of the vernier should always be made to coincide with the highest part of the curve of the mercury column. 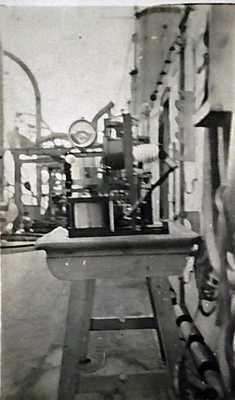 Great care should be exercised in handling this instrument, as a sudden lowering of the top generally means breakage, owing to the vacuum at the top of the mercury permitting it to fall practically as if it was a solid metal rod; barometers should be inverted very slowly, and packed with their cisterns ends up. A place should be chosen for it; suspension low down, and, if possible, near to the centre of gravity of the ship, out of the way of traffic, and in as uniform a temperature as possible. How to read the Barometer. Sketch showing Scale and Vernier on a Mercurial Barometer. An Aneroid Barometer depends for its indications on the movements of the top of a metal drum which is made very thin and corrugated, after which it is partially exhausted of air, thus making it very susceptible to the slightest changes in the external pressure. This top is connected to a pointer by means of very delicate mechanism, which has the effect of greatly magnifying its movements. This pointer can be set at any pressure by means of a screw at the back of the instrument, and, as owing to its extreme delicacy, the mechanism is always somewhat liable to derangement, the reading of the instrument should frequently be compared with that of the mercurial barometer, and if any difference is noted it should be set to correspond with the latter instrument. The great advantage of the aneroid is its convenient size, and also the rapidity with which it will show any change of pressure. Also it can be kept in the chart-house immediately under the eyes of the officer of the watch. A Thermometer is an instrument for measuring the temperature. It consists of a closed glass tube with a hair-like bore, terminating in a bulb at one end. The bulb and part of the tube contains mercury, the remainder of the tube being a vacuum. A graduated scale is attached. The thermometers used for sea temperature are enclosed in metal cases to prevent breakage. The water should be drawn clear from any discharge from the ship, the nearer the bow the better, and the thermometer should be immersed for several minutes. If a canvas bag is used it should not be placed in a draught, as evaporation will materially lower the temperature. When re-setting, all that is necessary is to swing the instrument bulb down; this force, together with that of gravity, enabling the mercury at the bottom of the bore to overcome the friction in the contraction, and thus re-enter the bulb. After being re-set and suspended bulb up it should read the same as an ordinary thermometer observed at the same time. A Minimum Thermometer differs from an ordinary one in that alcohol is substituted for mercury on account of its transparency and non-liability to freeze; also a small black glass index, shaped like a dumb-bell, is inserted into the column of liquid in the bore of the tube. Its action depends on the power of cohesion of the particles forming the surface of any liquid which is illustrated by the familiar experiment of floating a needle on the surface of water in a cup. To set the instrument it should be held with the bulb inclined upwards, the index will then slide down until one end comes to the surface of the liquid in the bore, through which it is unable to break, and this end should show the then temperature of the air. Supposing that the instrument is placed horizontal, and that the temperature rises, the index will remain stationary, and the liquid flows past it up the bore, but if, on the contrary, the temperature falls, the index is carried towards the bulb, as soon as the surface of the liquid in the bore touches it, its movement being continued until the temperature stops falling. The primary cause of all winds is a difference of temperature; which, in turn, owing to hot air rising, causes a difference in pressure over two areas, and the air flows from the regions of high pressure to the regions of low pressure. The hot air over the equator rising causes the air to flow towards the equator from the high latitudes. If the air remained at rest, relative to the earth's surface, wind would not be felt; but it is felt at once if the air is driven to a latitude having either a faster or slower revolutionary motion. At the equator the earth's rotation is about 1,000 miles an hour, and at the poles nil. The air from the higher latitudes, where the earth's velocity is comparatively small, flows to the lower latitudes; where the velocity is great, and is deflected from East to West, or in a direction opposite to the earth's rotation, hence trade winds blow roughly from N.E. and S.E. Wind systems are either "cyclonic" or "anti-cyclonic." Cyclonic Winds are those which blow round an area of low pressure, and generally travel quickly, and are accompanied by strong winds. They blow spirally inwards round the area of low pressure; against the hands of a watch in the northern hemisphere, and with the hands of a watch in the southern hemisphere. Anti-cyclonic Winds are those which blow round an area of high pressure: they travel slowly, and are generally accompanied by fine and settled weather. They blow spirally outwards from the area of high pressure; with the hands of a watch in the northern hemisphere, and against the hands of a watch in the southern hemisphere. "Stand with your face to the wind and the area of low pressure will be on your right hand in the northern hemisphere, and on your left hand in the southern hemisphere." Wind is said to "veer" if it shifts in the direction of the hands of a watch, and to "back" if it shifts in the opposite direction. Force of the Wind.- An instrument called an anemometer (a sketch of which is given) registers the velocity of the wind. The instrument is placed in the air, with the fan-wheel facing the wind. The velocity can then be read from the dial by noting the difference in the readings between times given by a stopwatch. The pressure in pounds per square foot is given by P = .003V2 where V is miles per hour. There are several forms of anemometers, varying in size from a pocket edition upwards. TABLE SHOWING THE FORCE OF THE WIND AS REGISTERED BY BEAUFORT'S NOTATION. Cable.- As a measure used in marine surveying is one-tenth of a nautical mile, which is estimated roundly at 6,000 feet. Thus, 1 cable = 600 feet = 100 fathoms. Chain.- The unit employed in the actual measurement of lengths by surveyors. The land surveyor's chain consists of 100 links = 4 poles = 22 yards = 66 feet. The marine surveying chain is 100 feet. Degree.- Is the angle subtended at the centre of a circle by an arc equal to the 360th part of the circumference. A degree is subdivided into 60 minutes, and each minute into 60 seconds. A degree of longitude is equal to 4 minutes of time. Earth.- The circumference of the earth at the equator is little less than 25,000 miles. Fathom.- Measure of length and equal to 6 feet. Soundings are reckoned in fathoms. Knot.- The common term for a nautical mile used at sea = 6,080 feet. Mile.- The common and authorised land mile used by the English = 1,760 yards = 5,280 feet. Sound.-At an average temperature of 62° (F) travels at the rate of 1,125 feet per second. Time.- A definite portion of duration. It is marked in a general manner by the recurrence of striking natural phenomena, such as the alterations of light and darkness, and the succession of the seasons. Thus the two natural measures of time are the "day," or period of the earth's rotation on her axis, and the "year," or period of the earth's revolution in her orbit. Common time is reckoned from an "initial instant" or "epoch," independent of local situation, which is the same for all the inhabitants of the earth. Local time is reckoned at each particular place from an epoch determined by local convenience, such as the transit of the sun's centre over the meridian of the place. Greenwich time is the mean solar time of Greenwich. Ship time is the mean solar time at the place where the ship happens to be. In East longitude it is evidently before Greenwich time, and in West longitude behind, every 15 degrees of longitude making a difference of one hour.